Shayn Cunningham of Trumann is getting a chance to do what many high football players dream of doing. 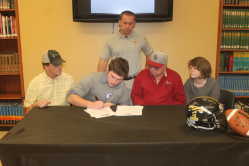 Cunningham will play college football after signing his scholarship offer from Faulkner University in Montgomery, Alabama last Wednesday in the library at Trumann High School. Cunningham played football for Gosnell through his junior year before moving to Trumann. Cunningham played played on the offensive and defensive lines for a Wildcat team that finished the season 1-9. Cunningham said the season was a character building season for him. "The season taught me hard work doesn't always bring you wins, but if you work hard it can get you where you want to be." Sean Cunningham helped his son in the recruiting process. Having signed up with the website beRecruited, Faulkner found Cunningham and stayed in contact with him until they offered him the scholarship. According to Trumann coach Scott Waymire, two words describe the type of player Cunningham is. "Consistent and reliable is what Shayn is. He came to practice everyday and worked hard during those practices. He played different positions for us had to play hurt due to our number of players." "If he keeps that work ethic for Faulker, he will be successful," Waymire added. Cunningham hopes to see playing time immediately, but will be okay if that's not the case. Looking to play fullback or linebacker, Cunningham wants to help the team in any way possible. "I'm a hard worker. I want to play, but I'm more worried about the team. I'll help the team in anyway they need me too," Cunningham said.